Traveling can be tough when your a homebody. We understand, however as technology has improved, some brilliant entrepreneurs had a series of great ideas. This group of like-minded individuals pondered if it was possible to bring all the great aspects of the outdoors indoors… And it looks like they’ve succeeded. Today we’ll be going over 4 outdoorsy locations for indoorsy people! What do I mean by outdoorsy locations for the indoorsy? Why of course I’m talking about large scale resorts and theme parks that one would typically find outside… But instead it’s inside. This may seem like something out of Pauly Shore’s Biodome, but we have the pictures and sources to prove these places exist. Keep in mind we’ll be browsing through a selection of locations outside of the USA, so if you’re currently a US resident you’ll have to obtain a new passport in order to attend. Located just south of Berlin is our first stop on today’s adventure. The Tropical Island Resort feels out of place in landlocked Germany. 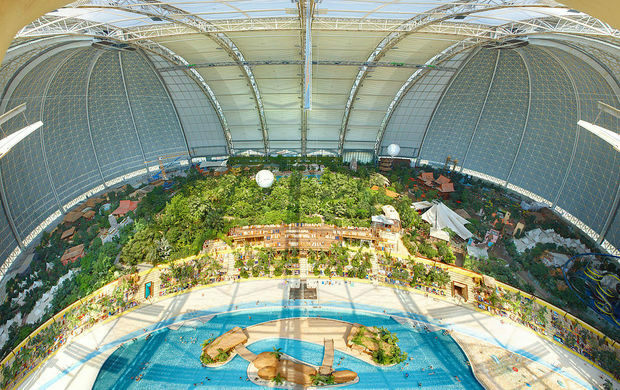 The resort features a beach, that’s right, a massive indoor beach that generates its own waves to simulate the actual experience of being at a beach. On top of that, this tropical paradise is also chock full of tropical foliage and fauna, making it the largest artificial tropical rain forest in the world as well as the largest indoor beach! That’s what I call a two-for-one. The park was created by a Malaysian investment group who assumed that the people of Germany deserved a beach despite not living in a country with one. The investment group assumed right, and this park now sees almost 1 million visitors each year! Now, most people who would be interested in attending such a place are going to be German since that’s the target audience, but don’t let that stop you from checking out this spot! In addition to a massive indoor beach and artificial rain forest Tropical Island Resort also has a zip-line. Why go to Costa Rica to zip line through the jungle and get your wallet stolen by monkeys when you can just as easily go to Germany zip line through the artificial jungle and get your wallet stolen by a pickpocket? Hard to think of a good reason, we know. Do keep in mind that if you’re traveling to Germany in the winter and want to escape the typically cold weather you can always head to this resort. Be wary however, you may find it harder to get a slice of this tropical paradise when the locals are attempting to escape the cold as well. Either way, you’ll need to obtain a passport if you plan on entering Germany, and some rumors about future EU laws may require US citizens to acquire a visa as well. If the cold is your thing and you’re wondering if there’s anywhere– ANYWHERE in the world that can satisfy your 24/7 need for a place to roll around in the snow, do we have some news for you. The Harbin Wanda Indoor Ski and Winter Sports Resort is the exact opposite of our first entry. Built in the Chinese city of Harbin, which coincidentally is known as “The City of Ice” and is also the location of the world renowned “Harbin Ice and Snow Festival,” this massive indoor sky resort is the largest in the world! The total cost to complete this complex came out to about $4.6 billion dollars. The first thing you should expect to find in this winter wonderland is ski slopes, which thankfully the resort has many of, six to be exact. The slopes vary in length and width so there’s something for beginners to experienced skiers! If skiing is too much of an outdoors activity for your indoorsy lifestyle you’ve got nothing to worry about. The resort provides much more than just slopes and snow. If you’d like, you can always slide over to the ice hockey rink for a quick game or just to practice your ice skating skills. If neither of those activities suit you, or if you’re just being difficult, you can always check out the mall or movie theater… Or one of the several restaurants the resort has to offer. Essentially the Harbin Wanda Indoor Ski and Winter Sports Resort has everything you need in a large scale ski resort, that being said before writing this article I wasn’t sure if anything other than snow and skis was needed. If you do plan on heading to Harbin to visit this resort you’ll need a China visa. If you’ve never been to a country that requires a visa and don’t know what that is, don’t worry! We have plenty of resources on our sister website for first time travelers to China. It should be stated that you need a valid passport before you can attain a visa to ANY country. So before booking a trip with the hopes of leaving the states, apply for either a new passport or passport renewal if you already have one. If neither sand nor snow tickles your fancy perhaps something more commercial might appeal to you. IMG Worlds of Adventure located in Dubai is the world’s largest indoor theme park, the complex is in fact so large that it’s classified as the single largest temperature controlled environment in the world. Enjoy all the fun of trouncing about as if you were in Orlando in the summer except you don’t have to wear any sunscreen until you step out into that sweet sweet desert sun at the end of your day. IMG Worlds features a variety of activities and rides as one would expect a theme park to. The park was created by the IMG Group, the park currently features five distinct sections. Two of these sections are based off the American enterprises of Cartoon Networth and Marvel comics, the properties included in these areas were essentially leased out to be used for the theme park. The remaining sections include a “main street” style strip call Img Boulevard, a Jurassic Park inspired section call “The Lost Valley” and finally a large movie theater with 12 screens called the Novo Cinema. Like any theme park worth its salt, IMG Worlds has a variety of activities to do. There are currently 17 attractions in the park, some are winding roller coasters for thrill junkies and others, such as LazyTown located in the Cartoon Network section (though I could have sworn that show aired on Nickelodeon in the states), are aimed at a much younger audience. If theme park attractions aren’t your thing you’re also welcome to stop by one of the 37 shops and restaurants to pick up some grub and some themed plastic souvenirs. Conversely, if you’ve had enough walking for the just stop by the Novo Cinema and catch a flick, with 12 screens there’s bound to be something playing that you’ll like. If none of the activities currently offered interest you then perhaps you’ll only need to wait a few years before something new crops up in IMG World. There are already talks about expanding the park to include a variety of other zones, including areas dedicated to (but not limited to), Nickelodeon, Pokemon, Disney, Mattel, Sabban, Anime World, Ubisoft, TV Tokyo, and Legends of Arabia. As well as all of the just mentioned zones, this expansion would also include a new Cartoon Network and Lost Valley area. The new areas would be located in a large complex adjacent to the already existing one. This new park extension will be called IMG Worlds of Legends and you can see a concept image by clicking here. No doubt that once construction is complete it’ll be decades before another indoor theme park comes in close to the size and scope of IMG Worlds of Adventures. But what if you don’t want to go to any of these places? Now you might not have plans to travel to any of the locations we’ve mentioned thus far, not because the crazy indoor locals don’t impress you, but because you have no plans to visit the country it’s located in. That’s fine! As mentioned in each individual entry, these are the “largest” in the world of their particular kind. That means there are others sprinkled about the world that might not be as large but might scratch the itch you’ve been trying to for years. For example, the Harbin Wanda Indoor Ski and Winter Sports Resort is only one of many in China, there are actually an alarming 27 indoor ski slopes in China, including some that are currently in development. And that’s just in China! Several countries in Europe also have indoor ski slopes such as: Belgium, Germany, France, The Netherlands, Norway, Spain, the UK. Two are currently in development here in the states as well, so don’t experience FOMO if you aren’t planning on traveling out of the country soon! As far as indoor beaches go those are a bit tougher since several countries already have beaches. However there are still a few to be spoken for! Naturally China has once in Chengdu, this one rivals the one in Germany as it also features a beach with wave pool. There are also locations in Japan and Kazakhstan. Finally, while it isn’t as luxurious as it’s counterpart in Germany, The Fallsview Indoor Waterpark in Canada is a good option if you live in the Northern USA and want to see what all this indoor beach nonsense is about. Fallsview is located close to Niagara Falls which makes it only a short distance from the US-Canada border. This makes Fallsview your go-to assuming you have either a US passport or passport card to cross the border. Finally we have indoor theme parks. You can actually find few of these sprinkled throughout the states. No, I’m not talking about Chuck-E-Cheese’s or Dave n’ Busters, those don’t count. The Adventuredome in Las Vegas, Nevada offers many of the amenities that IMG Worlds does, and all without leaving the country! However, if you want to go all out on your US indoor theme park vacation, we’d have to recommend the one located inside of The Mall of America. Located in Bloomington, Minnesota, is the largest mall in America when you account for the theme park attached to it known as ‘Nickelodeon Universe”. While Nickelodeon Universe is no IMG Worlds, it’s still the largest indoor theme park in the States and it has three unique roller coasters. The best park? When you’re done riding those three roller coasters five times each, you can easily spend the rest of your day browsing through the biggest mall in the country. If indoor locations aren’t your thing, maybe you should check out this article and learn about some places that may not be around in the next century. 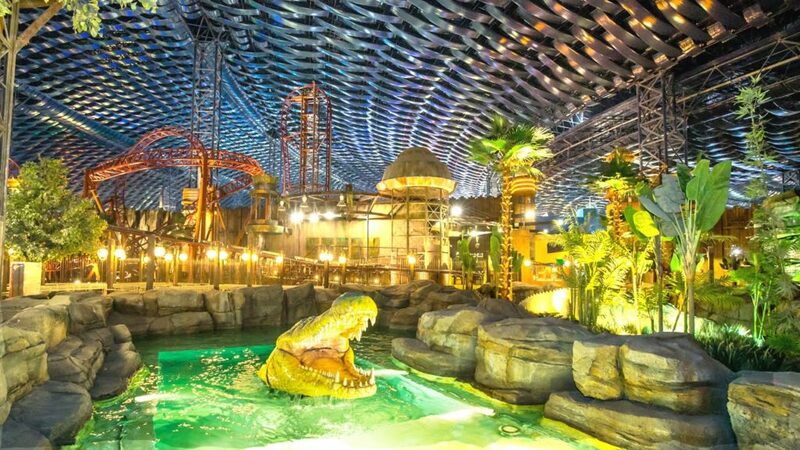 If you do plan on traveling internationally to visit any of these groovy indoor attractions you’ll need to obtain a passport first. Lucky for you, we’re experts when it comes to passport. Whether you’re in need of a new passport, passport renewal, or if you’re just looking for some information, visit our main website here to get started today! This entry was posted in Others, Travel and tagged new passport by The Passport Office. Bookmark the permalink.